A room with modern design and equipment, it’ll charm you with its spectacular view. You can enjoy either the fell scenery, or the horizon to the south. The spacious hotelroom has a bathroom and WC. The sofa-bed provides an extra bed for two. Most of these rooms have a balcony or terrace. A spacious room with high ceiling and a bathroom and wc. The rooms have modern equipment with allergy-free materials. 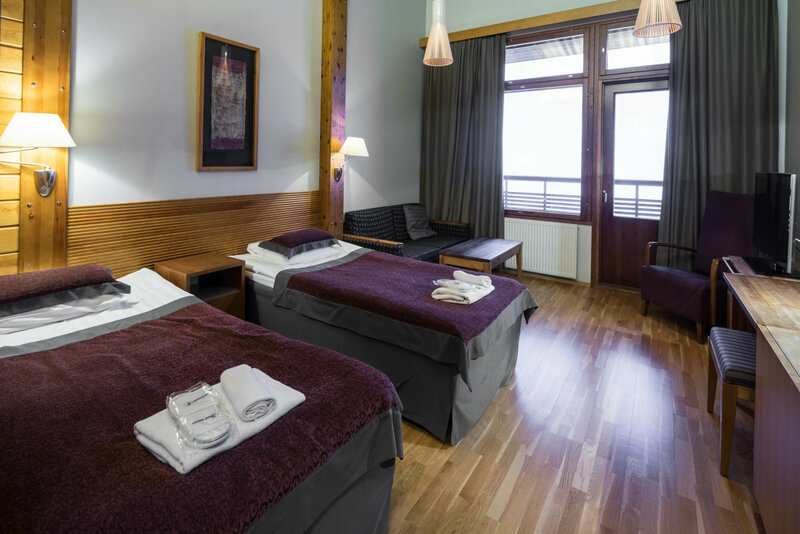 Superior-rooms are located on the top floors of the hotel. These rooms have a balcony. The sofa-bed provides an extra bed for two. None of the other hotels are located as high in the fell as Lapland Hotel Saaga. This means that the magnificent views of our rooms look out either onto the fell, or to the horizon hundreds of kilometers away. Our rooms and apartments are meant for all types of people — an outdoor person, someone who wants to enjoy life, families, or couples. Holiday apartment with living room-kitchen and sauna. Two fixed beds for two persons. Saaga Chalet apartments have a fixed indoor connection to Lapland Hotels Saaga. One bedroom apartment with living room-kitchen, sauna and WC. Two fixed beds for two persons in the bedroom. Possibility to make two extra beds out of the sofa-bed if needed. 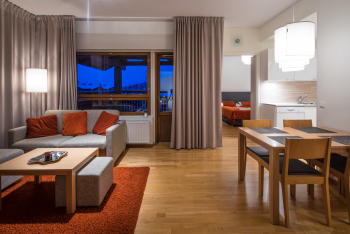 Saaga Chalet apartments have a fixed indoor connection to Lapland Hotels Saaga. Two bedroom apartment with living room-kitchen, sauna and wc. Two fixed beds for four persons. Possibility to make two extra beds out of the sofa-bed if needed. Saaga Chalet apartments have a fixed indoor connection to Lapland Hotels Saaga. 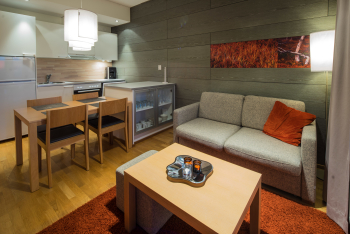 One bedroom apartment with living room-kitchen, sleeping alcove, sauna and wc. Two fixed beds for two persons in the bedroom and the sleeping area has a bunk bed. Possibility to make two extra beds out of the sofa-bed if needed. 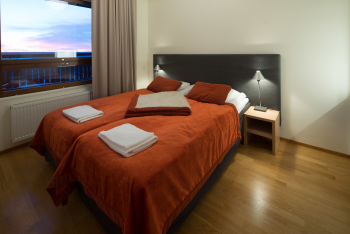 The apartments are located near the main building of the ski centre, approximately 200-300m from Lapland Hotels Saaga. 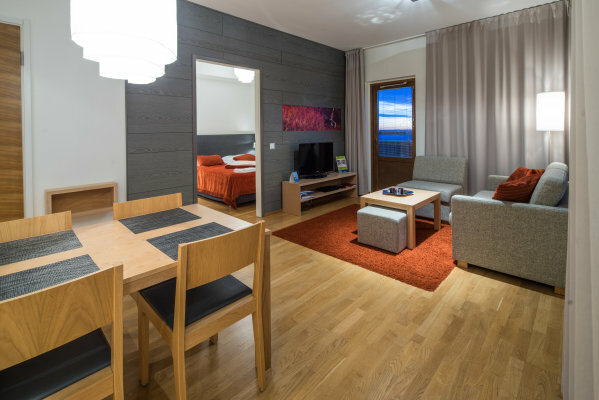 Two bedroom apartment with living room-kitchen, sauna and WC. Fixed beds for four persons. Possibility to make two extra beds out of the sofa-bed if needed. The apartments are located near the main building of the ski centre, approximately 200-300m from Lapland Hotels Saaga. 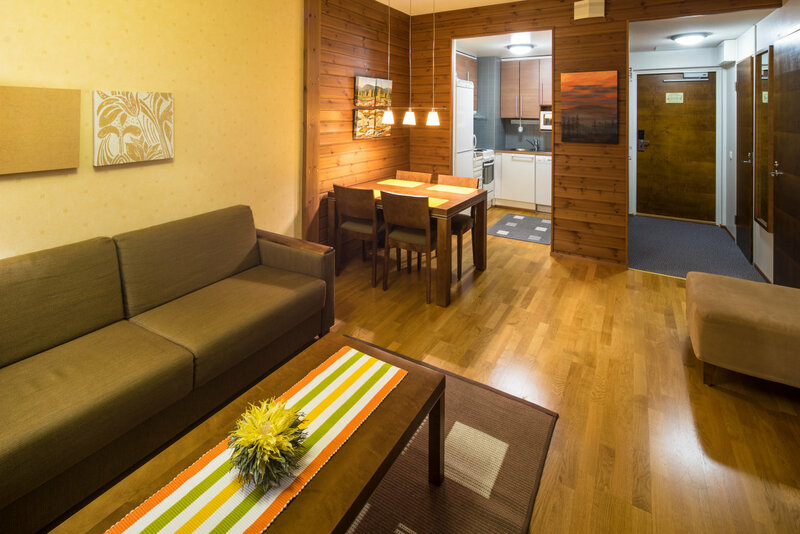 Three bedroom apartment with living room-kitchen and sauna. Beds for six persons. Possibility to make two extra beds out of the sofa-bed if needed. 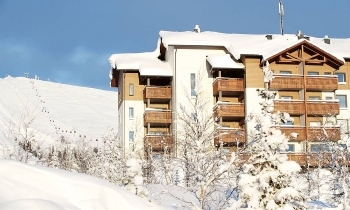 The apartments are located near the main building of the ski centre, approximately 200-300m from Lapland Hotels Saaga. 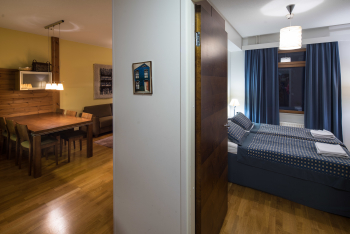 One bedroom apartment with living room-kitchen, sleeping alcove, sauna and wc. Two fixed beds for two persons in the bedroom and the sleeping area has a bunk bed. NordicChalets apartments are located near the main building of the ski centre, approximately 200-300m from Lapland Hotels Saaga. Two bedroom apartment with living room-kitchen, sauna and wc. Fixed beds for four persons. Possibility to make two extra beds out of the sofa-bed if needed. 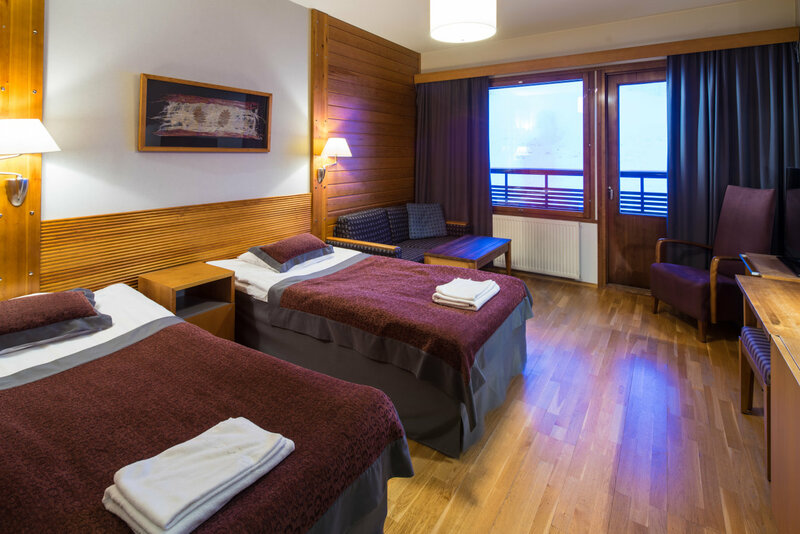 NordicChalets apartments are located near the main building of the ski centre, approximately 200-300m from Lapland Hotels Saaga. 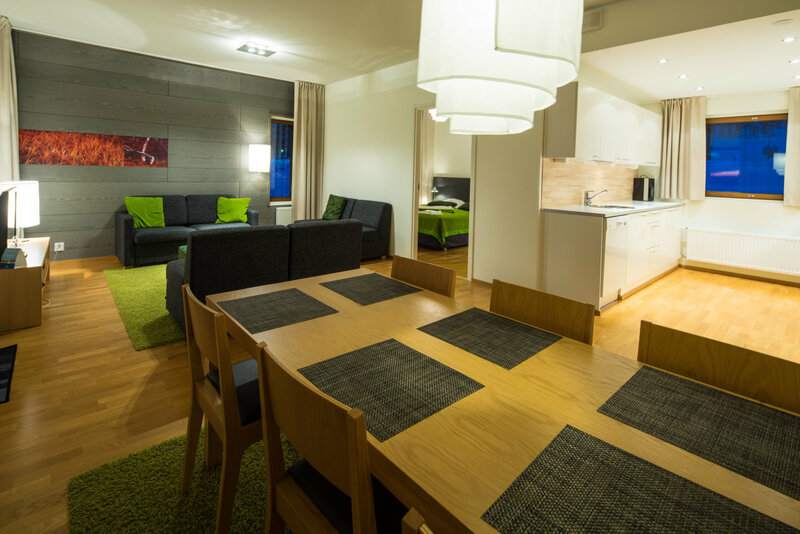 Three bedroom apartment with living room-kitchen, sauna and wc. Fixed beds for six persons. Possibility to make two extra beds out of the sofa-bed if needed. 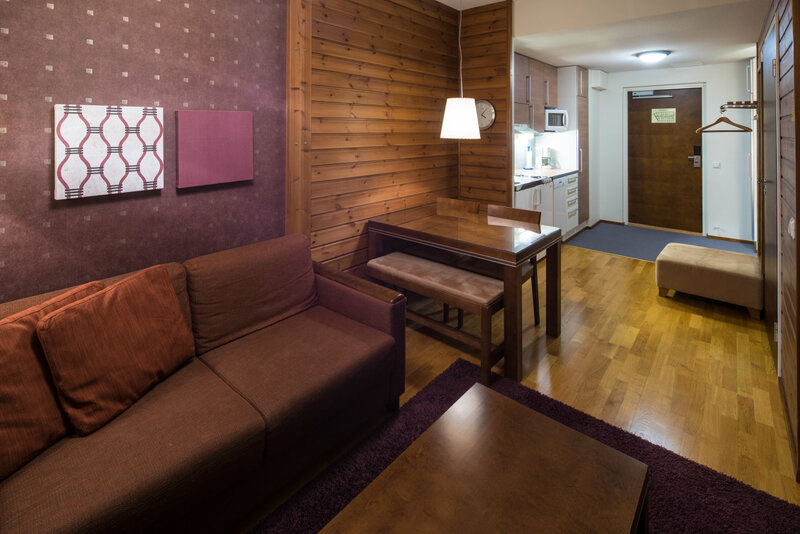 NordicChalets apartments are located near the main building of the ski centre, approximately 200-300m from Lapland Hotels Saaga.